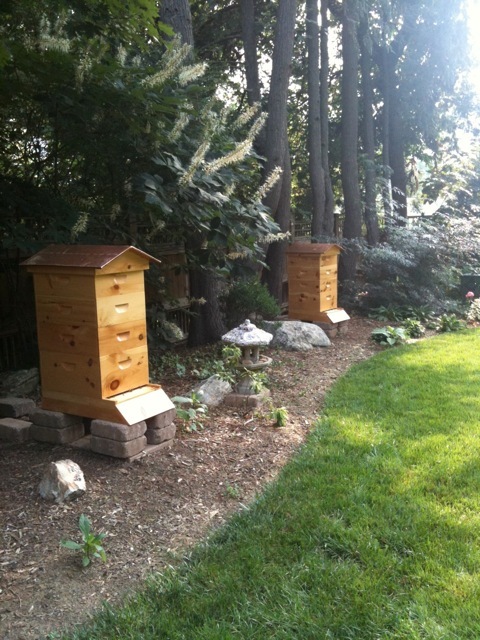 Laurie and Brian's bee yard. 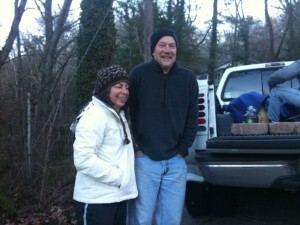 2011’s amazing bee-ish tide brought Laurie and Brian, two new beekeepers, to my shores. They jumped into beekeeping with gusto. It was a joy to help them in their bee yard and to witness their devotion to becoming good honeybee stewards of two precious hives. By fall, these hives were brimming with vitality and ready for winter in every way. Laurie and Brian and the bears' bee yard ... after the bears had Thanksgiving. 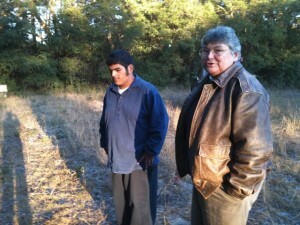 By Thanksgiving, there was much to give thanks for. And by the end of Thanksgiving, when Brian and Laurie were out of town, a family of bears had also celebrated. 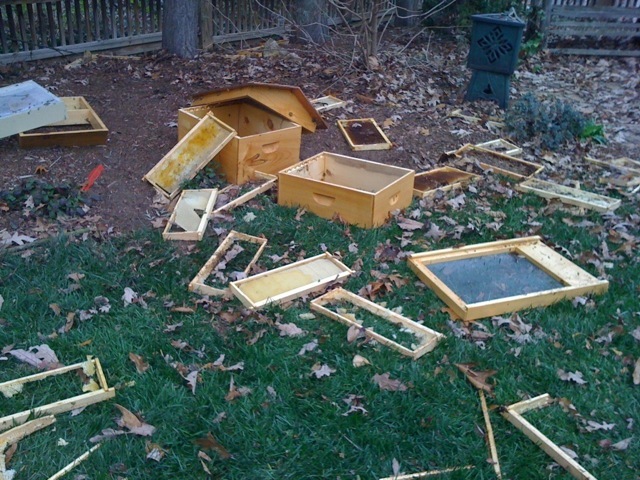 They tore up the hives, flinging boxes, frames and (of course) the bees around like confetti. 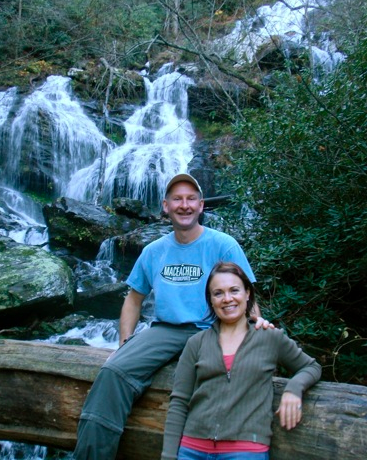 What was bliss for them was deeply heartbreaking for Laurie and Brian … and life threatening for the bees. Bears are not the bad guys here. They are somebody’s children, too. And like the bees, they have to forage for food. 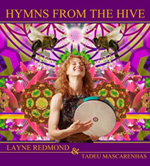 It is natural that brood-and-honey-filled hives would appeal. And it is unnatural that bears should choose to be in such close proximity to humans. Who would think that a bear fence would be needed so close to downtown Asheville, NC? But like many species these days, their habitat has been encroached. This was also a very droughty year, affecting both bees and bears in many parts of the country. So the bears came, they smelled, they conquered … and feasted. Lauren and John (who saved the day). Laurie called me after “the event”, utterly distraught. 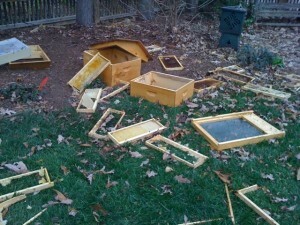 The only smidgeon of good news was that dear friends, John and Lauren, had immediately gone to the bees’ rescue. 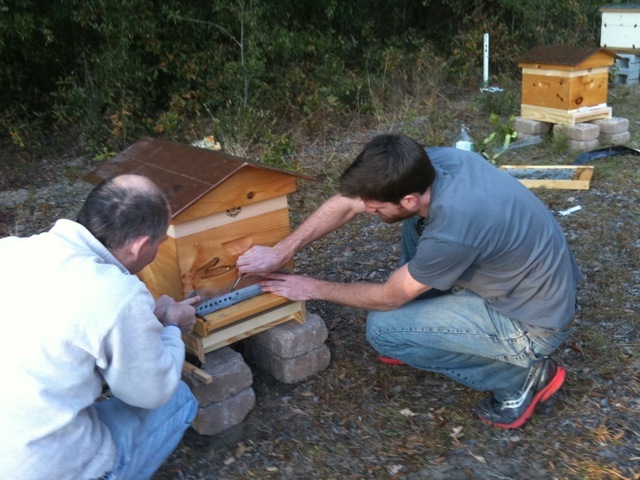 They gathered up two small balls of bees from the ground (the only remnants of the two hives), re-housed them in hive boxes, and drove them to their bee yard a few miles away. These two folks are some of the true heroes of this tale because without their intervention, the bees would have died that night. The cold and damp would have meant a sure death. 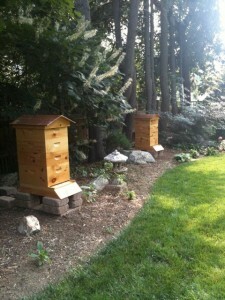 Rescued bees in John and Lauren's yard (far right). Laurie was also disheartened because she had already talked to another beekeeper who had advised her that softball-sized populations of bees, going into winter with no food, are unlikely to live. They are too small a group to maintain the warmth the cluster needs to survive the winter. They cannot be without food, but they are unable to forage for food in the cold. The need for the bees to cluster and maintain the warmth of the colony usually trumps their choice to break cluster and take food … even food that may only be inches away (like in a baggie of sugar water a beekeeper places inside the top of a hive). By winter, bees need to have food right there on the frames, right where they are clustering (like wintering in a cottage with honey-filled walls). The odds were sobering, if you could call them odds at all. But love is a mighty thing and bee love is no exception. 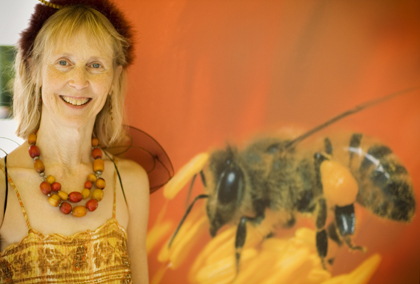 Neither Laurie nor I were willing to let the bees die if there was anything under the sun, moon or stars we could do. We discussed a few emergency feeding strategies and I told her I’d call her back the next morning with any further inspiration … and inspiration She came. The bees' foster family: Candy and her son Andrew. 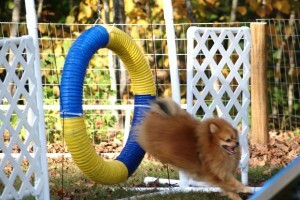 Foxie, one of Ken and Mary’s Rescue Poms, flies like a bee during her agility training. 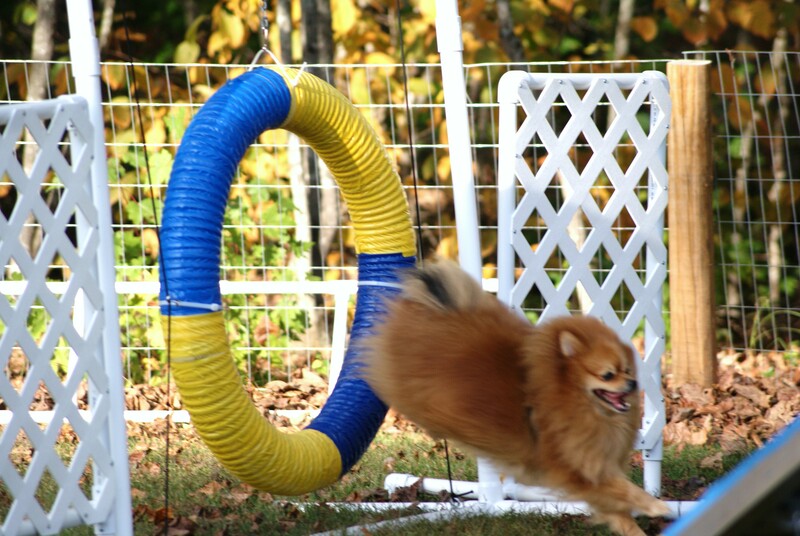 I also remembered that friends Ken and Mary (having retired from beekeeping to focus on their passion for raising and training Rescue Pomeranians), had given me some unharvested frames of honey, stored all year in my basement. 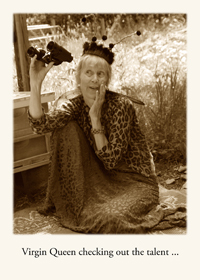 I ferreted out two frames, took them to Laurie and she put them in the hives. With a full frame of honey each, the hives were good to go (food-wise) for a while. Miraculously, the weather was also warm enough one afternoon for Laurie and Brian to go into the hives and confirm that both colonies’ queens were alive and well. They had survived! Long live the queens! 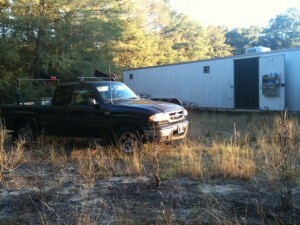 Brian's race car (and bee) trailer. And so the Great Bee Migration was orchestrated. Brian (as it happens) is a race car driver and had a race in Savannah, SC the following week. So he and Laurie fetched their bees from John and Lauren’s yard, put them in the trailer with his race cars, drove to Candy’s yard in SC, settled the hives in with friend Lyman’s help, said their fond goodbyes, thanked their lucky stars (and Candy), and drove on to the race … hoping, as we all hope, that April will bring a reunion and a return to Asheville … to a yard surrounded by love (and a bear fence). And until then, what will be, will be(e). Brian and Lyman release the bees into their foster yard! When Laurie got home from SC, she shared this: Every single (bee) is so precious … Moving them south we hope will give them half a chance. 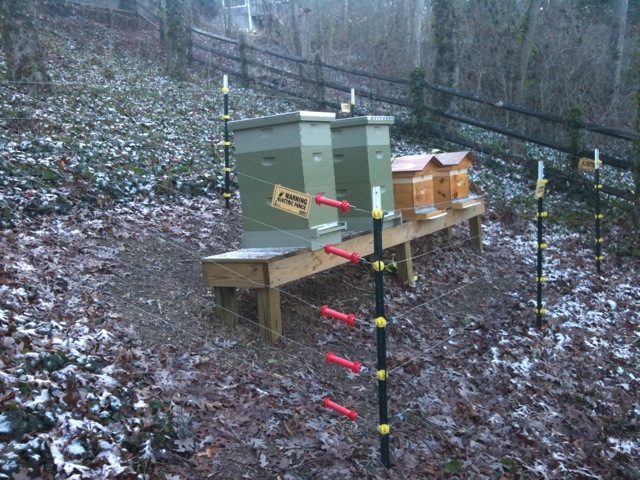 The mountains are cold but hopefully these mountain bees will return to thrive. Trying not to get my hopes too high – but feeling good after seeing them with the will to continue through it all … It’s so good to bee in this community! I think that most days, the little things are really the big things. Simple acts of caring, despite many un-simple moments of anxiety, inconvenience and distress (for bees and humans), ignited a community of folks that mostly didn’t know each other before this saga began. Who’d have foreseen the divine constellation of us, this colony of champions that was enlivened by this adventure? Such is the path with bees. And such is the opportunity of love, if we allow it. Brian and Laurie ... true bee-loveds and some of the best friends honeybees ever had. 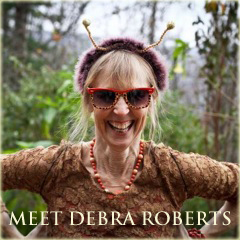 I shared this tale with my friend Deborah Littlebird in New Mexico and she reminded me that all of this goodness unfolded because we slowed down enough to listen to our hearts. I want to thank a whole lot of hearts and a whole lot of people who listen to their hearts. And I want to thank the bees, one more time, for bringing out the best in us. I am convinced love is a conspiracy … and will always win in the end. P.S. And thank you E.V., Mary Beth, Tory and Bret for the (s)heroic love tale you also played out a few days prior, a short distance away, when (probably the same) bears brought you together for another epic bee rescue. Rock on Lavender Hive! Previous post: DESCANSOS FOR THE BEES: Kaylynn Sullivan TwoTrees’ memorials commemorate the loss of our honeybees.